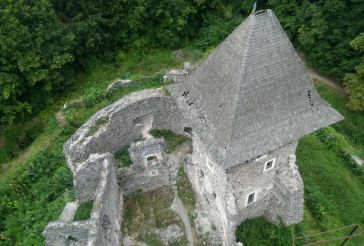 Palanok Castle, Ukraine: photos, description, on the map. In the Latorytsia River valley in the middle of the plain you can see a single mountain. 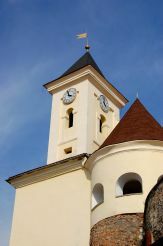 Its top is crowned with towers of the medieval Palanok Castle. 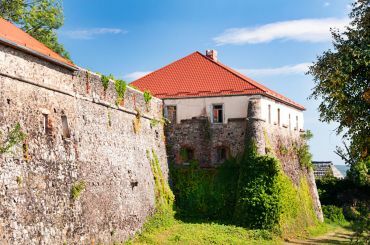 This fortress is located in the south of Mukacheve city, which is surrounded by mountains. 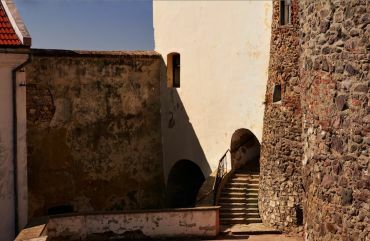 This historical site doesn’t look like any other. For almost thousand of years Hungarians, Russians, Ukrainians, Austrians and other nations have shed the blood inside of this powerful fortress. How many roundups and assaults Palanok Castle saw! The owners of this place have been changed a great number of times. Barons and graphs, kings and princes aimed to own it. 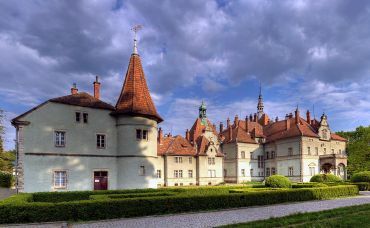 The castle used to be prince’s large dwelling house, king’s residence, the capital of Transil’vania and the center of Hungarians’ uprisings against Austrians. 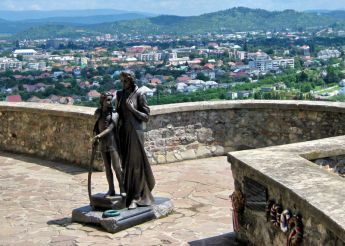 The most impressive view is by entering the city from the side of Beregova town. You may take beautiful photos at this place. 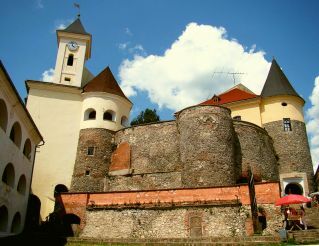 It will be interesting for tourists to hear numerous legends about Palanok Castle. 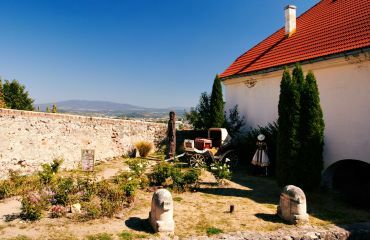 One of them is about a well, situated by an ancient tower on the territory of the castle. People say, evil participated in a construction of the building. By the order of the prince Koriatovych, who was an owner of the castle, hollowing of a scale was started to find out water, but it was unsuccessfully. The well was very useful thing since it is impossible to stand a siege without water. The prince became sad and, out of malice, said he would give a sack of gold the one who finds water. Suddenly, a grey man appeared and jumped into the well. Having climbed out, he said the water would be very soon, and he would come for the promised reward. The prince frightened as he realized, he was dealing with something bad. A jester came to help and offered the prince to put 2-3 coins into the sack as far as a certain number of gold was not mentioned. This was the evil was deceived. Today, they say, one can hear some grumbling on the bottom of the well. There are many legends about underground passages on the bottom of the well to take you both to and far away out of the city. 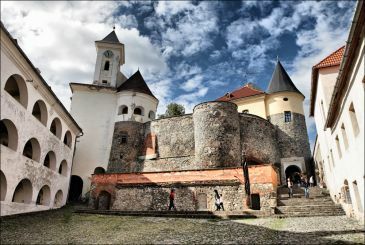 By visiting the castle you will definitely meet its former owner Fedir Koriatovych. The Monument in his honour, made full-length of bronze, greets all the visitors. You may put money at his feet and then, by tradition, it is necessary to ask for wealth and touch its forefinger. Some people believe these wishes come true. Palanok Castle is a mystery place. 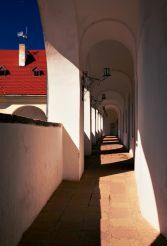 You’ll have opportunity to walk along its halls with a guide, listening to stories about different miracles of the castle and its ghosts living in the cellars. Or you can go alone and imagine yourself as a member of an ancient count family. Be sure to feel romance of the Middle Ages. By the way, the staff of the History Museum, which is situated in the castle, may tell you a story of the 70th about a strong earthquake, when the building was frequently quaked. A horrible sound of voices was coming from the cellar. All the staff went out, but after coming back they realized, many objects moved to other expositions. 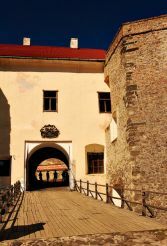 However, the biggest mystery is that a huge key, where an alarm system was installed, found itself at the portrait of Ilona Zrynia, the proprietress of the castle. The experts detected this portrait was changed a little. The sculpture of frozen in bronze courageous Ilona Zrynia and her son Florents is amazing. A historical event, army siege of Austrian emperor of 1686-1688, merits a special attention to pay. 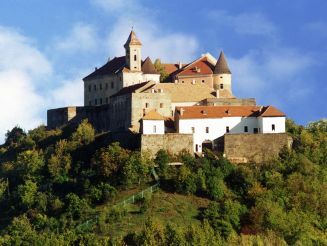 During the castle siege, Ilona, the princess, headed uprising against Austrians. According to legends, the princess didn’t drop a tear. Her brave beauty charmed even enemies. When the Austrians invaded the castle, they met high, dark-eyed woman with a sword protecting her daughter and son behind her back. You are well advised to visit an interesting exhibition of the History Museum in the hall of Verkhniy Castle. 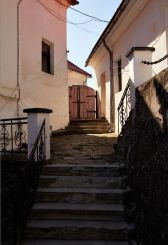 There you can find archeological excavations and expositions of Zakarpattia region: iron, stone and wooden implements, as well as exhibits of this land dating back to the Middle Ages. Art gallery contains a great collection of unique icons dating back to 19th-20th centuries, works of famous artists of the last century as well as canvases of modern Ukrainian, Polish and Hungarian masters. 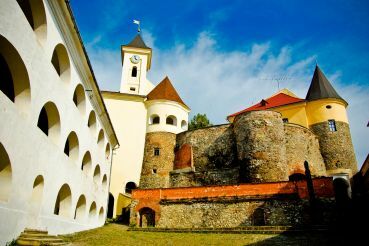 In Palanok Castle there is a place of furious battles far back in the past of bastions, where you can enjoy a cup of coffee observing an exciting panorama of Mukacheve.